Creating a new living space outside is easier than building one indoors. Building the perfect patio is easier because you do not have to deal with walls, ceilings, doors, and windows. As long as you have a floor, you have everything you need, which makes building the perfect patio an easy and rewarding do it yourself project. Building your own patio is very cost effective and can be accomplished in a matter of days. It will yield long-lasting results and provide great opportunities for you to spend time with friends and family outdoors. Before you begin building the perfect patio, you must consider what material you will use underfoot. 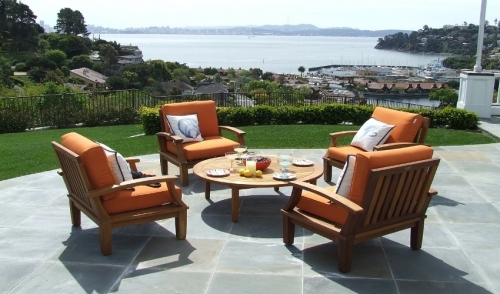 The surface you decide to choose will play a huge role in establishing the style and costs of your patio. There are many possibilities to consider, but check out these three popular options. The first surface to consider is concrete. The beauty of a concrete patio is that if you choose to use precast modular slabs, it is DIY-friendly. Concrete patios can vary from smooth simple surfaces, or can be tinted and textured to resemble a patio that is made of brick or stone. However, even though concrete is DIY-friendly, there is no learning as you go because the concrete will begin to harden as soon as water is added. If there is an already existing layer of concrete, a thin overlay of concrete with a deep relief can spice up the surface of your patio without replacing it. With concrete you can give your patio a textured veneer or colorful squares. Another option to consider when building the perfect patio is gravel. Gravel is both inexpensive and easy to install. It is the ideal surface for budget-minded homeowners. More importantly, gravel offers an informal patio with versatility for more complicated backyards. The last option to consider is bricks and pavers. Baked clay bricks and concrete paver, are small and lightweight enough to fit into place single-handedly. This will give your patio a fairly smooth surface that can be easily maintained and swept clean when needed. Clay brick usually comes in red, but is also available in yellow and gray, whereas pavers come in gray, muted shades of red, yellow, brown, black, and green. Jazz up your brick patio by adding a zigzagging herringbone pattern that will help lock the bricks into place. Even though the patterned surface of the brick gets the attention, the real work comes from what lies beneath. In order to build the perfect patio with brick or paver, build a sturdy base layer topped with stone dust allowing the polymeric sand to fill the joints between the bricks. There are also other options such as mortared brick and interlocking pavers. You can add to a patio by including a pergola, a patio set, and various plants and flowers. If that is not enough, add a shiny finish to your patio with a concrete sealer.